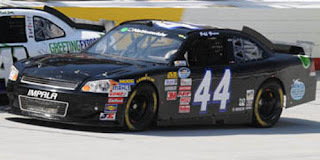 Jeff Green picked up the 18th last-place finish of his NASCAR Nationwide Series career in Saturday’s Aaron’s 312 at the Talladega Superspeedway when his unsponsored #44 TriStar Motorsports Chevrolet fell out with a vibration after 1 of the race’s 124 laps. Green’s finish marked the 400th last-place finish for Chevrolet in the history of the NASCAR Nationwide Series. No other manufacturer has more than 163 (set by Pontiac). Green qualified 30th at a speed of 174.321 mph, besting seven other “go-or-go-home” drivers on the 43-car entry list. Just after the opening lap of the race, he pulled behind the wall, followed on the next circuit by Carl Long in the Craig Partee-owned #68 Marro’s Truck Ford. *This was Green’s first Nationwide Series last-place finish at Talladega since 1993, when his Wayne Day-owned #16 31-W Insulation Chevrolet fell out with an engine failure after 2 of the race’s 117 laps. It was Green’s fifth career last-place finish in the series. *The #44 had never before finished last in a Nationwide race at Talladega. Joe Nemechek returned to the #87 that finished last with Kevin Conway at Las Vegas and enjoyed his first top-five finish in nearly six years. After pushing Mike Wallace to the lead in the middle stages of the event, Nemechek’s ExtenZe Toyota led for four laps and paced the field as late as Lap 118. He was still running side-by-side with race winner Kyle Busch when Wallace’s flip ended the race under caution.